What tooth number is this tooth? Do you know the names and numbers of your teeth? Can you only say "The pointy one in the top right side!" Let's get to know your teeth better here; it will make you a better communicator with your dental professional – you'll even be able to pinpoint specific teeth over the phone! The universal numbering system, identifies each tooth in a person"s mouth with an individual number. This system references all the teeth that should be in your mouth, so if you have wisdom teeth (or other teeth) which have been removed, those numbers still exist. # 1 is your upper right wisdom tooth. Each tooth then progresses up one number all the way across to the 3rd molar (wisdom tooth) on the left side of the mouth (# 16). #17 will be the lower left wisdom tooth, and counting clockwise, the last tooth will be #32, the lower right wisdom tooth. Because most people do not have 32 teeth, due to wisdom tooth extraction, congenitally missing them or extraction due to non-restorable dental conditions, we will skip over any missing numbers. It is also important to know the names of the teeth! Your front four teeth 7, 8, 9, 10) and your front lower four teeth 23, 24, 25, 26) are incisors. Incisors are mainly used for gripping, cutting and shearing food, and are the first thing a person sees when you flash your smile. Incisors also play a dominant role in speech. Moving further back are the canines (or cuspids).On the upper jaw, canines are also named "eye teeth" because the long root almost points to the eye socket. 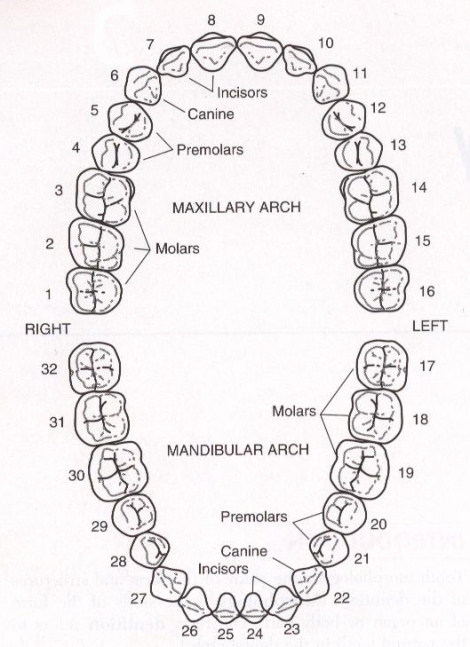 They are #6 and 11 (upper jaw) and #22 and 27 (lower jaw). Canine teeth are relatively long and pointed, used primarily for holding food while it is being ripped in the mouth.They are an important guide for the bite of your teeth; usually they are the first to wear away. Once canines are worn, other teeth will wear away quickly. Behind the canines lie the bicuspids (or premolars #4, 5, 12, 13 (upper jaw) and #20, 21, 28, 29 (lower jaw). Bicuspids are a sort of "in between tooth," with the properties of both the canine and molar teeth. These teeth transfer food from the canines to the molars for proper grinding. Finally, the molars make up the rear-most teeth in your mouth. Depending on if you have your wisdom teeth or not, you will have 8 or 12 molars, which lie directly behind the two biscuspids in each quadrant of your mouth, #2, 3, 14, 15 (upper jaw) and #18, 19, 30, 31 (lower jaw). Molars are like a grinding table, carrying out the smashing and grinding of food for digestion. Next time, try to communicate with your dental professional the name or number of your tooth that is being discussed. It would impress and earn great respect from your dental professional, and would also be the first step to knowing your teeth! Once you know your teeth better, you will likely find taking care of your dental health easier more interesting. If you learn these numbers, you will be one step ahead of most people regarding dental communication!